At this rate, ‘no news is good news,’ right? There’s an over-saturation of news and opinions of the news right now, and none of it seems to be any good. (Yup, I'm still talking about the news...) Current events aren’t just current events - they are immediate events. Something happens, it’s recorded or documented on someone’s phone and posted within seconds, and then for the next 24 hours (or less) there is a cycle of versions/opinions circulating about the event until the next current event is posted. It’s kind of exhausting, right? There seems to be more division than ever. I'm sure many of you, like me, are feeling incredibly disjointed and disconnected these days. I'm a white American heterosexual person. I can only imagine how my Muslim, LGBTQ, and friends of color are feeling. In a week where swastikas were scrawled on NYC college dorm room doors and found spray painted in a beloved Brooklyn Park, I’d like to share some good news! Some ‘immediate’ events that I happened upon that have stayed with me, that gave me a smidgen of hope despite the sadness and fear that seems inescapable these days. They’ve helped me feel more connected to the world around me and feel less alone during this incredibly isolating time. They reminded me that we’re all on this planet together regardless of where we came from or where we hope to be going. We all have a story to tell and it’s important to listen, even when we disagree. A few weeks ago, I was in Union Square Park with friends visiting from out of town. There was a gathering around what looked like a human cobweb. Adults and many children were part of a big circle and they were attached to balls of yarn. All of these individual lines were crossed, knotted, looping under and over each other but ultimately staying connected. It was a student project and I talked to the kid who organized it. He said initially he had 3 people holding onto the ends of their balls of yarn and then tossed the balls to one another. More people joined in, more yarn balls were added, the tossing continued, the circle widened. Some parts of the web got chaotic and some continued to weave gracefully in and out of each other. Some lines were taut and some were slack. The student didn’t offer a clear symbol he wanted to represent, he was interested in getting people involved, letting people draw their own conclusions, and feel like they were part of something. My take away was no matter our background, our beliefs, our culture - we’re threaded together. We’re all part of a network that is sometimes smooth and sometimes a disjointed jumble of knots. That we have to keep widening the circle to make room for everyone. That I need to hold onto my line to keep my part of the web strong. My other NYC current event you might have seen on the real news. I’m happy to say it’s received a lot of attention. It's the Subway Therapy Project. Not all of the Post-its were positive, but everyone was welcome to leave a thought, vent something, affirm something. Make a wish for the world, offer a blessing, or to encourage another reader. I got to see the original project before it came down at the 14th street subway station in the tunnel connecting the orange and red lines. 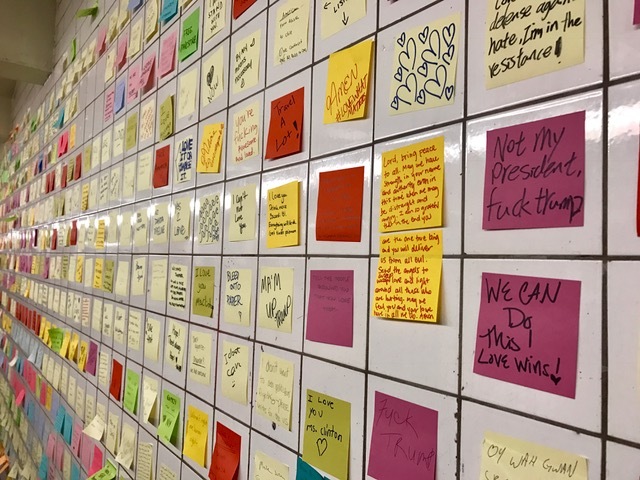 Those walls (below) were more organized and sparse, each Post-it got showcased in his own subway tile. Now it seems 'copycat' Post-it walls have taken over the Union Square 4, 5, 6 tunnels and the Atlantic station. The little papers create an actual wall paper resembling fabric. It's mesmerizing to see in person. Whomever started it and whomever is continuing it is spreading some good news! If you’re in NYC, go leave a love note to feel connected or a note of gratitude for the upcoming holiday. A holiday side dish that isn’t squash! Preheat oven to 400°. Toss celery root with oil on a rimmed baking sheet and season with salt and pepper. Roast until golden and tender, 20–25 minutes. Toss warm celery root with pecans, thyme leaves, and cherries.